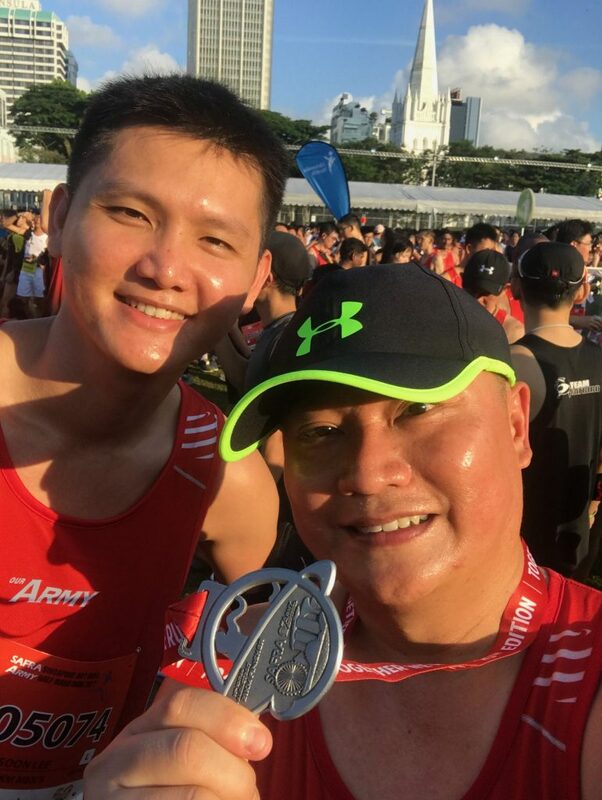 SAFRA Singapore Silver Jubilee Bay Run & The Army Half Marathon: Together We Run, From My Generation To Yours | JustRunLah! Hola Runners! As “Every Singaporean Son”, we have to go through the rite of passage in what we called National Service. We have to lay down at least 2 years of our lives and together as one people serve the nation even though we are all from different backgrounds and ethnicity groups. From strangers to acquaintances and from “Ah Boys to Men.” The camaraderie stays with us throughout our lives even when we already have Operationally Run-Out Date (ORD), Operationally Ready National Servicemen (ORNS), Mindef Reserves (MR) or became Ex-NSmen. 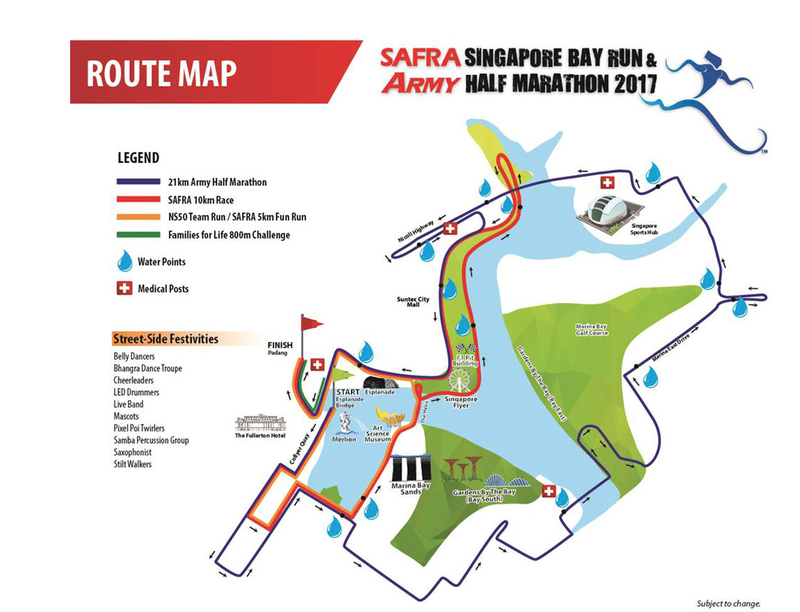 This is a special year as it marks the 25th edition of The SAFRA Singapore Bay Run and the Army Half Marathon. 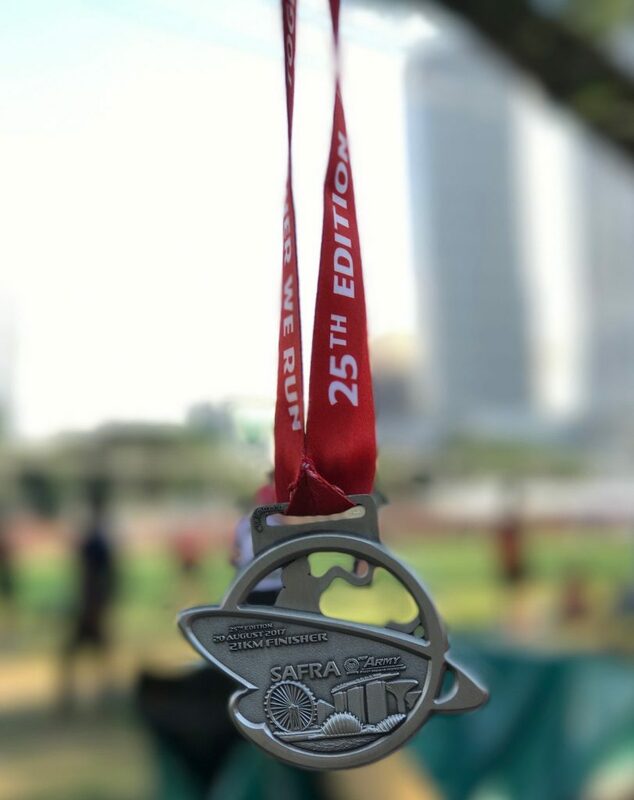 The difference between these two runs is that The SAFRA Singapore Bay Run comprises of the competitive 10km Race, non-competitive SAFRA 5km Fun Run as well as the 800m Family Challenge. Whilst the Army Half Marathon as the name speaks for itself is the 21km run. As this is also the 50 years of National Service (NS50), a special NS50 Team Run category has been introduced to mark the Silver Jubilee. 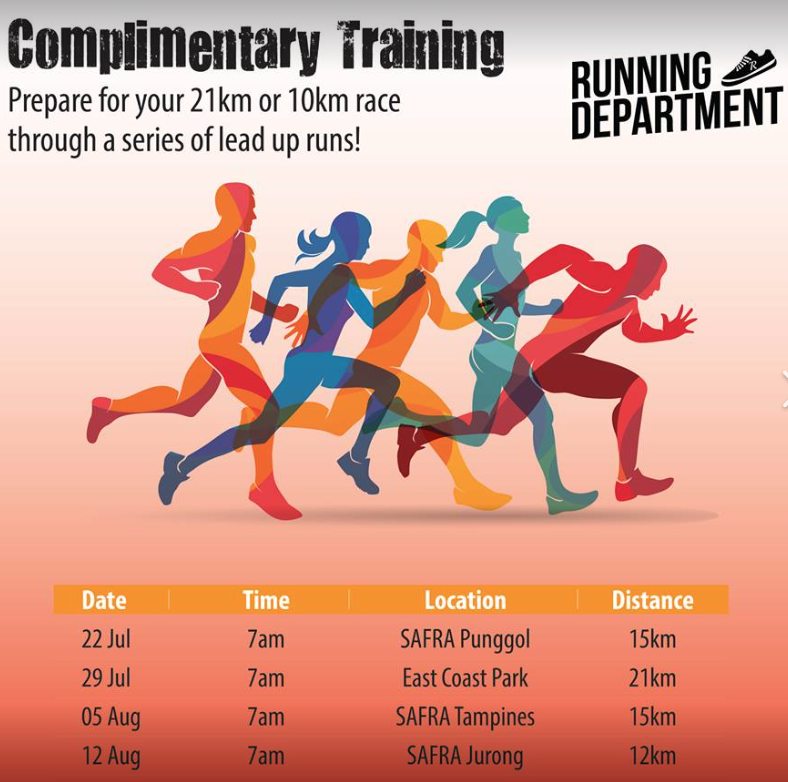 This is a non-competitive run and all past and present NSmen are welcome to participate. Teams of 10 runners each will complete a 5km route together to make up a total distance of 50km to commemorate NS50. 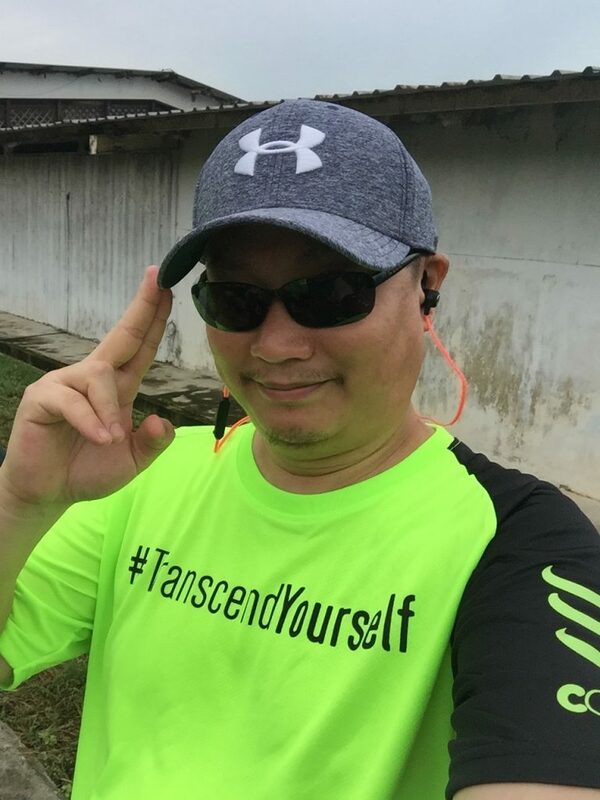 This much-awaited event was held on Sunday, 20th August 2017 at the Esplanade Bridge, Padang. Before the event proper took place, there was already much fanfare organized by SAFRA to promote and create awareness for the run at its various SAFRA open houses during the June holidays as well as encouraging the public to sign up which we could hear during the airing of SAFRA’s very own radio station: Power 98FM. 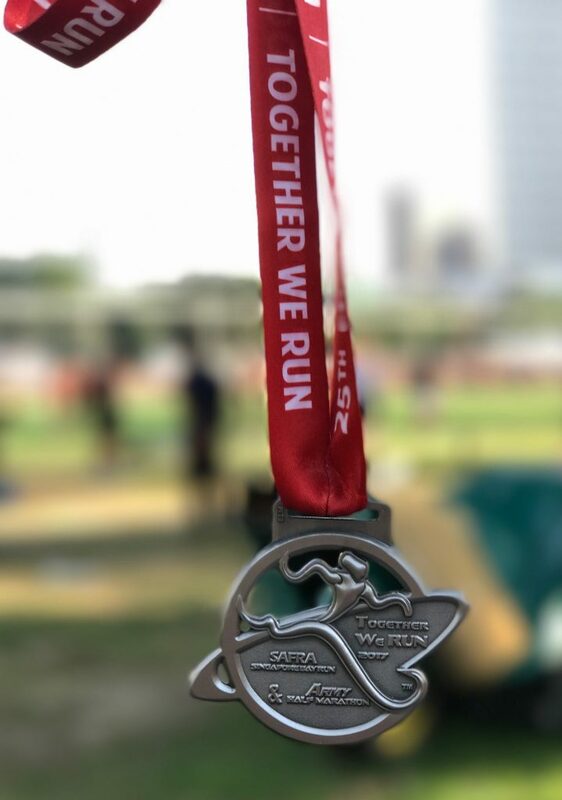 “Dun say we bojio, we jio you now!” In addition, there was also the complimentary training to prepare runners for the 21km and 10km race through a series of lead up runs. 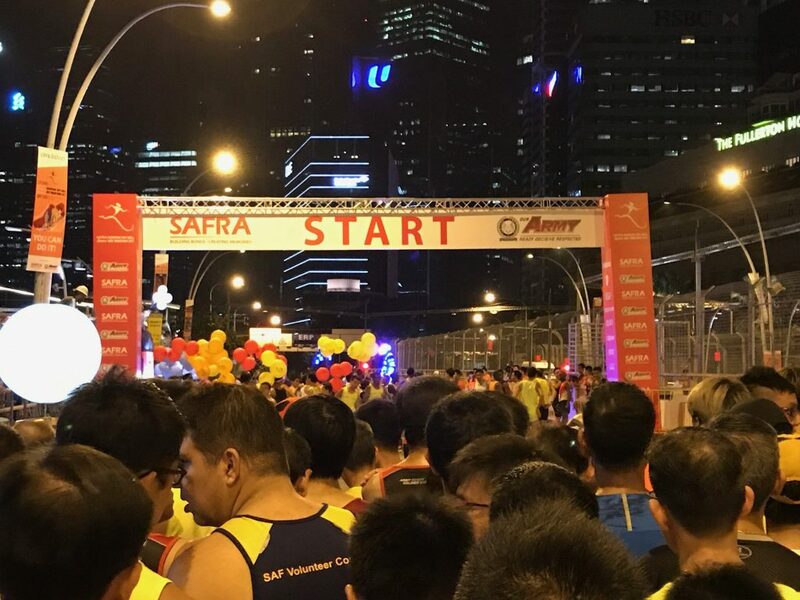 This is indeed a good initiative by SAFRA as it encourages and helps runners to prepare early for the actual day of the event. Together with my running kakis: JC & SL, we took part in the 21km Army Half Marathon. The running routes were released weeks before the event hence; we were well informed and mentally prepared for how the run would be. The 21km Army Half Marathon route is as follows: Esplanade Drive • Fullerton Road • Finlayson Green • Robinson Road • Maxwell Road • Shenton Way • Marina Boulevard • Central Boulevard • Marina Gardens Drive • Marina Mall • Marina Grove • Marina Barrage • Gardens by the Bay (East) • Marina East Drive • East Coast Park Service Rd • Fort Road • Mountbatten Road • Stadium Boulevard • Stadium Drive • Nicoll Highway • Republic Avenue • Republic Boulevard • Raffles Avenue • Esplanade Drive • Fullerton Road • St Andrew’s Road. 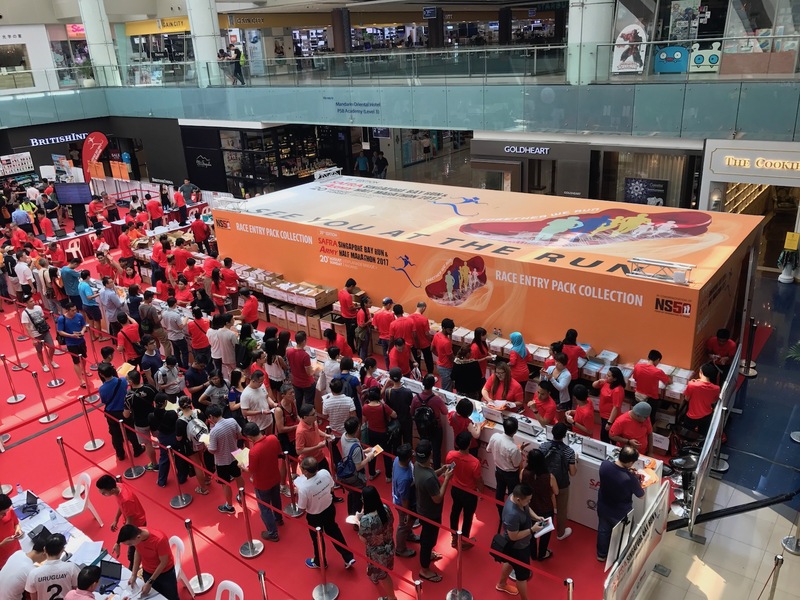 Race Entry Pack Collection (REPC) was held over the 3 days on 4 – 6 August 2017 (Friday to Sunday) between the timings of 11am to 8pm daily @ Marina Square Central Atrium. There was already the race atmosphere in the air and you could actually see the mood of most participants getting ready and excited for it. I collected my REPC on the first day itself and reached the venue at 10.50am being kiasu. The booths were already opened and there were participants collecting their REPCs. What initially was thought to be a huge crowd and long waiting queue turned out to be smooth and without delays at all during the collection. The human traffic flow was well managed and the signages for the different race categories were properly demarcated. I had my REPC collected by 11am. Even JC and SL who collected theirs on the weekends also did not encounter any crowds at all. What impresses me was that after collecting the REPC and before exiting the collection booth, there was a mock-up “finishing line” and upon walking over it, was able to detect the working condition of your bib. The participants’ details will also be shown on the wide television screen where they could check on. Fast forward to the race day itself and I was informed that JC could not join us for the run as she was down with flu which only left SL and myself. I reached the race village at 3.30am and after some warm-ups, quickly made my way to the start pen that was at the Esplanade Bridge. 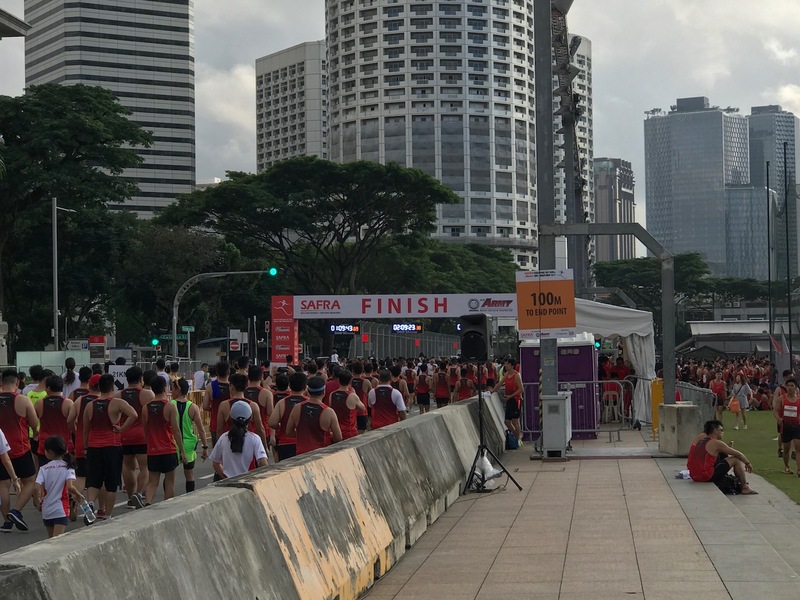 However, the runners were not allowed to proceed to the start pen that was about 100m away from The Esplanade that served as an initial holding area for them. At 4.25am, 5 minutes before the flag-off time we were then allowed to proceed to the start pen that saw many runners running towards it hoping to be the first to start the race. Even before the race starts, many runners were already sweaty due to the warm and humid weather although it was in the early hours of the morning. I was hoping for some rain to cool down the temperature but it did not happen. After some safety announcements by the emcees, the race for the half marathon was finally flagged-off at 4.38am according to my watch. Woo…Hoo! 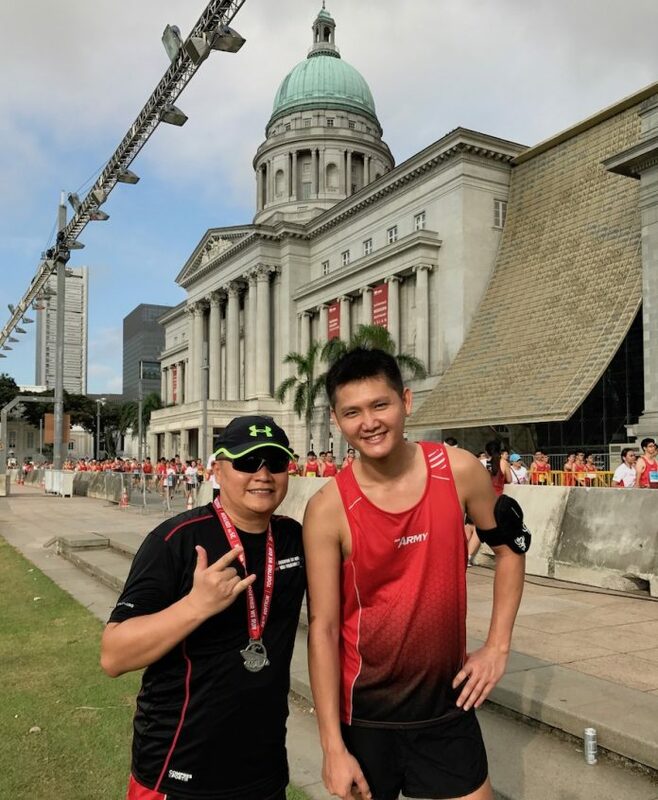 Against the backdrop of the city skyline illuminated by the street lamps and building lights, there was a sea of runners mostly donned in their red army singlet running down the roads that were earlier on, sleepy and quiet. There were more than 41,000 participants in this year’s event across all the categories! The new running route for this year’s event was generally smooth and without steep slopes and uneven paths. It was well organized and planned. Unlike other races, there are also no cyclists allowed on the running route that is another plus point and makes the runners safe. All races should adapt to this good practice and once the roads have been demarcated as running routes, no vehicles of any kind should be allowed. The warm and humid weather was also complemented with the many hydration points along the way that helpd to keep the runners cool and hydrated. Volunteers also provided the runners some Tiger Balm Active Muscle Rub to ease and sooth their aching muscles as well. However, the downside was that there were insufficient mobile toilets and not adequately placed along the way and runners have to queue up whenever they spotted them. You could also see the queuing line while running past the public toilet at East Coast Park. Along the running routes, there were also street-side performers entertaining the runners to both motivate and cheer them on. There were the live band, cheerleaders, belly dancers, saxophonist, stilt walkers, etc. Indeed, it was never a dull moment during the run as there were always activities lined up for the runners. There were also sufficient staff onsite to attend to medical emergencies as well. There were also bananas provided for the runners at certain stations as well. After finishing the run, I proceeded to collect both my finisher medal and finisher tee. The collection booth was quite empty and smooth flowing when I proceeded there. Overall, it was an enjoyable run and one to remember for a long time.